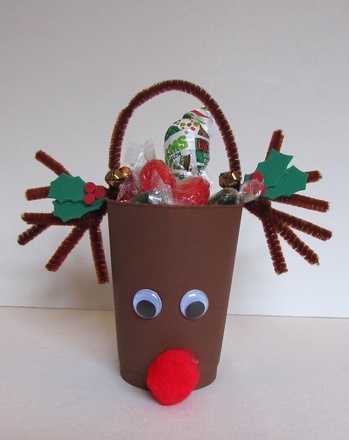 In this activity, youngsters can create adorable treat cups featuring the likeness of everyone’s favorite reindeer, Rudolph! Your kids will beam with pride as they present candy, snacks, or other surprises in these adorable handmade containers. They're perfect for house parties, school celebrations, and holiday bake sales. With a little adult assistance, junior crafters will find that making these adorable containers is a cinch! Start by cutting a square piece of wax paper to cover your work surface and protect it from paint. Ask your child to paint the outside of the cup with brown paint. Make sure he applies a thin enough layer so that paint doesn’t drip down the sides of the cup. Turn it upside down and let it dry for about an hour. Have your child apply a second coat of paint if the first coat didn’t cover the cup completely. Once again, turn it upside down and let dry. Let your child glue the pom-pom nose and googly eyes onto the cup and set it down on its side so that the nose and eyes don’t slide out of place while they dry. Nestle the cup in between two books to prevent it from rolling. Once those pieces are dry, ask your child to bend the pipe cleaner into an arch shape that fits inside the cup. Have him tape both ends inside the cup, leaving several inches of the arch exposed as a handle. Cut the remaining pipe cleaners into segments of about 4–5 inches. Simply wrap one piece around the other and twist to secure them so that the ends stick out like antlers. There really is no right or wrong way to do this, so let your child twist them together however he wants. Just make sure that the antlers rest on the rim of the cup so that the handle is unobstructed by them. Dress the reindeer up by threading Stretch Magic through two bells, tying it around one of the antlers and tying several knots before trimming it. Repeat with the remaining two bells and tie them to the second antler. Help your child draw four separate holly leaves on the green craft foam with a pen. Ask him to cut them out. To make berries for the leaves, have your child punch six holes in the red craft foam. Glue three berries onto each leaf. With a dot of hot glue, glue each leaf onto the antlers and press down for a few seconds. 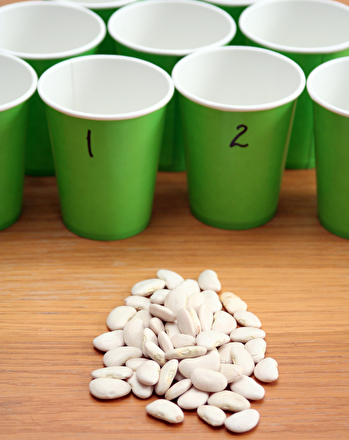 Now for the best part: put your child in charge of filling up the cups with treats! 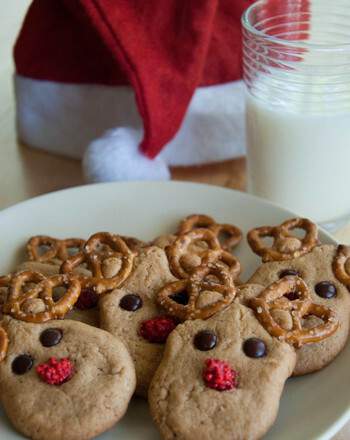 Set them at each guest’s place setting or send each child home with a reindeer full of treats at the end of a party. Who created Rudolph the Red-Nosed Reindeer? It was a man named Robert L. May who worked in advertising for a store called Montgomery Ward. In 1939, May was asked to come up with a Christmas story that could be given to shoppers as a promotional item. Drawing from the tale of the Ugly Duckling and his own childhood experiences (often being picked on for being small and shy), May wrote the story of an underdog reindeer that was ostracized by other reindeer because of his glowing red nose. In 1947, May’s brother-in-law, a songwriter, created the melody and lyrics to "Rudolph the Red-Nosed Reindeer." Two years later, Gene Autry recorded the song. It sold two million copies that year and became one of Autry’s best-selling songs ever. In 1964, May’s story was turned into a beloved television movie that is still a classic today. Delight the little ones with festive squirrel treat cups filled with candy and sweets. Kids can make this Christmas tree treat cup as a candy dish, decoration or party favors for the holiday season. This Rudolph craft will help your kid make a goofy and memorable ornament. 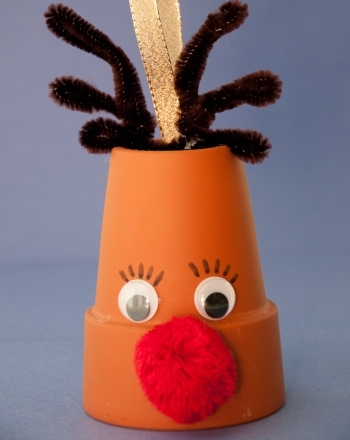 Make a Rudolph craft this winter to bring some added merriment to your Christmas. This Christmas season, colour in this cute depiction of the most famous reindeer of all: Rudolph!